Like many of you, we have been keeping a careful eye on the weather forecast. There is a winter storm warning in effect from 9 p.m. today through 6 p.m. Monday. Seven to 13 inches of snow are forecast. Following the snow, the forecast is for very cold wind chills in the coming days. Therefore, we have made the decision to cancel daytime and evening classes, and student activities at all three of our campuses on Monday, Jan. 28. Currently, UWM campus offices will remain open on Monday. Employees should check with their supervisors regarding attendance, working from home or taking leave. Employees should continue to watch email and the UWM website for updates about campus closures, which will be announced as follows. 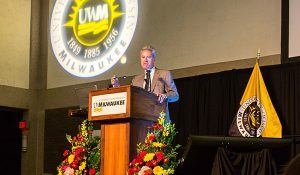 Notifications are posted on the UWM home page and as a recorded telephone message at 414-229-4444. A complete description of UWM weather closing procedures can be found here. Current weather information can be found at InnovativeWeather.com. Current watches and warnings can be found on the National Weather Service website.